Human beings are now dramatically changing our planet and altering the environment by modifying the global carbon cycle through anthropogenic carbon dioxide (CO2) emissions from the burning of fossil fuels. The CO2 concentration of air was around 280 ppm in 1750 AD (the beginning of Industrial Revolution), but it has increased over the last two centuries and is currently above 400 ppm. Carbon dioxide is one of the primary greenhouse gases in Earth’s atmosphere, together with water vapor, methane, nitrous oxide, and others. The Intergovernmental Panel on Climate Change (IPCC) intermediate RCP 6.0 scenarios (IPCC 2013b) predicts that the CO2 concentration in air will increase to 720–1000 ppm by 2100 AD and that the global mean temperature will rise by 2.6 °C. Comparison of CO2 concentrations in the atmosphere with fossil-fuel burning data indicates that about 60% of fossil-fuel emissions remain in the air. The remainder is mainly absorbed by the ocean, which may provide some relief from severe warming. Atmospheric carbon reservoirs are controlled by the formation/dissolution of both carbonate and organic matter (OM) in the ocean, which changes the chemical equilibrium of the marine CO2 system by removing/adding alkalinity in association with the release/absorbance of CO2 in the atmosphere (Fig. 1) (e.g., Kleypas et al. 1999; Kleypas et al. 2006; Orr et al. 2005). In open ocean, biogenic carbonate production is positively correlated with biogenic OM production, although the carbon ratios of OM to carbonate generally increase as OM fluxes increase (based upon the results from sediment trap experiments in the Pacific Kawahata 2002). Planktic foraminifera, which live in the ocean surface layers from tropical to polar regions, secrete low-Mg calcite shells and contribute 32–80% of the total deep-marine calcite budget in the global carbonate cycle (Schiebel 2002). The comparable carbonate contributor in the open ocean is coccolithophore. This is a unicellular, eukaryotic phytoplankton (alga) and one of the more abundant primary producers in the ocean, especially in tropical and subtropical oceans influenced by El Nino/Southern Oscillation phenomena (e.g., Beaufort and Grelaud 2017). In oligotrophic environments such as coral reefs and subtropical gyres in the Pacific, the symbiotic relationship between the host and its symbiotic algae presents three major advantages: energy from photosynthesis, an enhancement of calcification, and uptake of host metabolites. Bleaching is defined as (i) damage to the symbiotic relationships between hosts and algal symbionts and (ii) photosynthetic pigment loss (Iglesias-Prieto et al. 1992). Elevated seawater temperature brings negative effects on marine calcifiers; in particular, coral bleaching has occurred repeatedly since 1979 AD (e.g., Bunkley-Williams and Williams 1990) in tropical regions worldwide (Brown 1997; Hoegh-Guldberg et al. 2007). Mass bleaching events such as those in 1979–1980 AD, 1982–1983 AD, and 1986–1988 AD provide important opportunities for investigating the influence of bleaching during the early stages of this research area. Recently, bleaching has been found in benthic foraminifera in coral reefs (Schmidt et al. 2011). Coral reefs are among the ecosystems most vulnerable to environmental stresses associated with future climate changes caused by human activities (IPCC 2017). By the end of twenty-first century, the surface waters of the ocean could be more acidic, resulting in an undersaturation condition with respect to carbonate minerals in some areas of high latitude. Ocean acidification (OA) will induce severe stress in calcifiers, some of which are sensitive to environmental changes at global and local levels. Additionally, Oschlies et al. (2008) pointed out that anthropogenic CO2 emissions will extend oxygen-minimum zones, a 50% increase in the suboxic (defined as dissolved O2 < 5 mmol m−3) water volume by the end of this century, although a serious ocean anoxic event, which occurred in the Cretaceous, will not occur in the normal open ocean. Drivers such as OA, higher seawater temperature, or reduced dissolved oxygen concentration may overlap to amplify ecosystem impacts. Therefore, understanding the effect of environmental parameters (i.e., temperature, salinity, pH, and dissolved oxygen concentration) on representative calcifiers such as corals and foraminifera is essential for the verification of carbonate cycles and future environments. In the global carbonate budget, the carbonate production rates in the ocean and the tropical shelves are estimated to be ~ 1.0 Pg C year−1 and ~ 0.17 Pg C year−1, respectively. However, its burial rate to sediments in the ocean is ~ 0.15 Pg C year−1 via 85% dissolution in water column/surface sediments; this is comparable to that in the tropical shelves (~ 0.13 Pg C year− 1). Foraminifera, coccolithophores, and pteropods accounted for 43%, 22%, and 34%, respectively, in the ocean (personal communication with Prof. Tim Rixen). Of these, pteropods often produce aragonite shells, which are more liable to dissolution. Our discussion is focused on two major calcifiers, foraminifera and corals, although OA may impact other groups of marine organisms (e.g., Iglesias-Rodriguez et al. 2002; Catubig et al. 1998; Gangsto et al. 2008; Tambutté et al. 2011). In this review, initially, we describe the general features of the marine carbonate system and biotic and abiotic carbonate minerals. In the next section, we summarize the response of corals and foraminifera to OA. Photosymbiosis is regarded as an adaptive ecology for living in warm and oligotrophic oceans and also enhances calcification of the host’s skeleton (e.g., Stanley Jr. 2006; Moya et al. 2008). Therefore, it is believed to facilitate the prosperity of calcifying organisms in such environments. After discussing the role of symbiosis, we report the latest results on coral and foraminiferal bleaching including culture experiments, and then discuss the responses of symbiont-bearing calcifiers in a warm and/or high CO2 world. New chemical and isotope analyses of biominerals, together with visualization techniques for extracellular pH distribution, provide valuable information regarding biomineralization including calcification. Furthermore, the latest results on carbonate dissolution using X-ray micro-computed tomography will be presented. Finally, we discuss results on the response of calcifiers to different environments such as extreme warmth in the Cretaceous, the middle Eocene climatic optimum (MECO) event, and perturbations in the global carbon cycle at the Paleocene/Eocene boundary. This discussion includes the interaction between terrestrial and marine environments to better understand the key factors inducing OA in the past and the near future. These chemical reactions are termed “ocean acidification (OA).” The seawater pH of surface ocean waters was 8.17 at 1750 AD but this has decreased to 8.06 in the present day and is expected to reach to 7.93 (pCO2 = 560 μatm) or 7.71 (pCO2 = 1000 μatm) in the near future (Gattuso et al. 1998). OA is known as “climate change’s equally evil twin”, in reference to the significant and harmful consequence of enhanced CO2 in the atmosphere. As the pH scale is logarithmic, a change of 1.0 pH unit represents approximately a 30% increase in acidity. Silicate and carbonate weathering in this sequence of processes consumes the difference in the molar ratio of CO2. Over long timescales (104 to 106 years), it is suggested that only silicate weathering contributes to a net reduction of atmospheric CO2 concentrations, which are closely linked to past climate conditions (Berner 1992; Brady 1991). OA is in essence a CO2-related phenomenon in the ocean. Therefore, its basic physicochemical characteristics can be well illustrated by chemical equilibrium modeling of the CO2 system in seawater (Figs. 2, 3, 4, and 5, Table 1). Dissolved inorganic carbon (DIC = [CO2] + [HCO3−] + [CO32−]) and total alkalinity (TA = [HCO3−] + 2[CO32−] + [B(OH)4−] + [OH−] + 2[PO43−] + [HPO42−] + [SiO(OH)3−] – [H+] – [HSO4−]) are the most important parameters in the aquatic CO2 system because they are essential for representation of the laws of conservation of mass and electricity. A cross plot of DIC and TA is known as the Deffeyes’ diagram (Deffeyes 1965). pH and pCO2 can be shown in the contours in the DIC and TA plane because these parameters are functions of DIC and TA (Figs. 2 and 3). The four parameters, DIC, TA, pH, and pCO2, are all measurable parameters in the marine CO2 system. More importantly, OA is expressed as a horizontal vector in the Deffeyes’ diagram (DIC–TA plot), as shown in Fig. 2. OA is the result of increased oceanic CO2 uptake by continuing anthropogenic emissions. CO2 dissolution in seawater increases DIC but causes no changes in TA (Table 1). where [CO32−]sat and [Ca2+]sat are, respectively, the concentrations of carbonate and dissolved Ca2+ in equilibrium with carbonate mineral (CaCO3). [CO32−] and [Ca2+] are the observed CO32− and Ca2+ concentrations. [CO32−] is closely related to the acidity of seawater. Ksp is the solubility product, which is dependent on temperature, salinity, pressure, pH, and nutrient levels. The term Ω is also known as the carbonate saturation state and is calculated for both calcite and aragonite (Ωcal and Ωarag, Robbins et al. 2010). When Ω > 1, seawater is supersaturated with respect to carbonate minerals; conversely, when Ω < 1, seawater is undersaturated. Because [Ca2+] in the ocean has a long residence time (106 years), it can be assumed to be constant on a time scale shorter than 104 years. [Ca2+] is assumed to be proportional to the salinity level. Therefore, the carbonate saturation state (Ω) is mainly determined by [CO32−] and Ksp (Table 1). The saturation states of calcite and aragonite (Ωcal and Ωarag) can be calculated and shown in the DIC–TA plot (Figs. 4 and 5). OC modifies the CO2 system, and its change is represented by the horizontal vector in the DIC-TA plot. It always results in a decrease in Ω (Table 1). While OA may progress ubiquitously, the corresponding changes in pH and pCO2 vary locally. The most evident parameter to influence the pace of OA progression is temperature. By using the parameters for the carbonate system in the equatorial Pacific as representative, Fig. 3 summarizes the temperature effects on marine CO2 system parameters, including the saturation states of carbonate minerals (Table 1). Although pCO2 is sensitive to temperature (~ 4% increase per 1 °C), this cannot be seen in the upper panels of Fig. 3. In contrast, Ωcal and Ωarag show large variations according to the temperature settings (Fig. 3a–c). 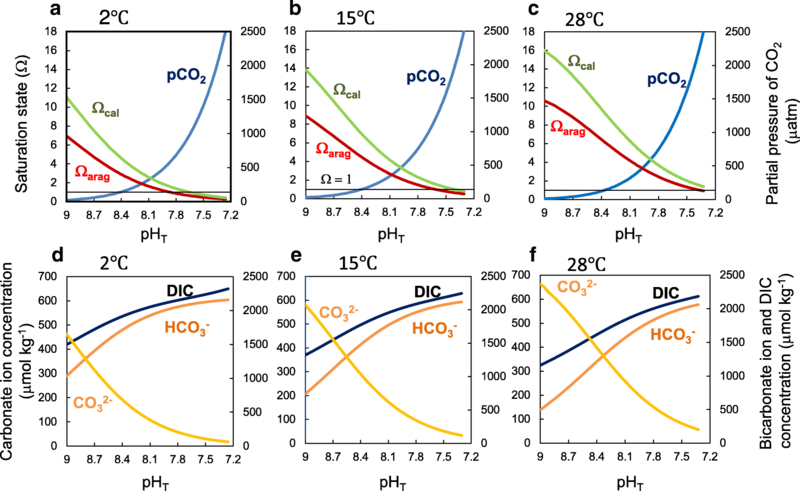 Ωcal of the 2 °C condition becomes lower than the critical value of 1 (carbonate dissolution) when pCO2 reaches around 750 μatm or pH 7.7 (Fig. 3c). In contrast, Ωcal for the 28 °C condition may not reach the critical value before pCO2 reaches around 2300 μatm or pH 7.3 (Fig. 3c), clearly indicating that OA is more critical in the polar and high-latitude regions compared with temperate and tropical regions. This trend become easily understandable in light of the temperature dependency of [CO32−], as shown in the lower panels in Fig. 3d–f. Another important factor influencing the saturation states of seawater with respect to carbonate minerals is pressure. Pressure affects carbonate solubility in seawater and thus Ksp and temperature. In order to depict the pressure effect alone, we prepared depth profiles of saturation states for calcite and aragonite at St. 96 (5° 00′ N, 144° 55.7′ E, water depth 4102 m, sampling date April 22, 1995) of the NOPACCS NH95-1 cruise (data were downloaded from http://pacifica.pices.jp/table/), as shown in Fig. 4. 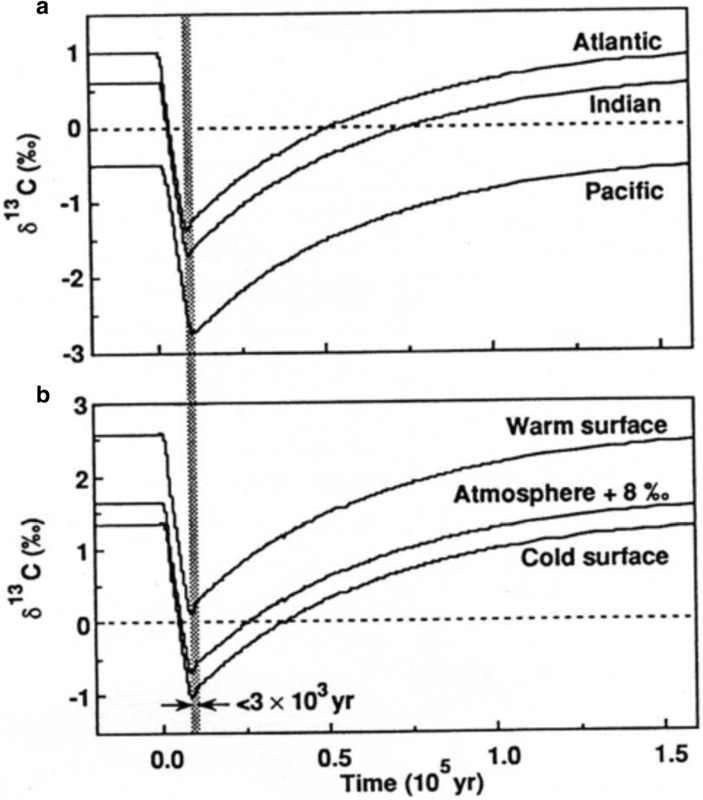 The pressure influence becomes dominant at greater depth because Ksp increases 1.72 times from the surface to 4000 m depth (Fig. 4d, e; Table 1). The corresponding saturation levels of the carbonate ion concentration [CO32−]sat are 41 μmol kg−1 and 70 μmol kg−1 at the surface and 4000 m depth, respectively. Note that the changes in CO2 system chemistry, i.e., degradation of OM and pH decrease, are responsible for the rapid decreases in Ωcal and Ωarag for the depth interval below the surface layer. Figure 5 illustrates a more quantitative comparison of the factors influencing Ω. The surface water compositions at St. 96 in the western tropical Pacific are again used as an example. Temperature decrease and pressure increase result in decreases in Ωcal and Ωarag in seawater (Fig. 5a, c), but the condition of undersaturation with respect to aragonite is never reached. On the other hand, the significant changes in Ωcal and Ωarag can be caused by ongoing and future changes in the marine CO2 system, indicating that OA is the prime driver of Ω under the conditions of climate change. The chemical composition, ultrastructure, and organic components of carbonate minerals ultimately determine their physical and chemical properties. An apparent difference in mineral solubility exists between the two major polymorphs of calcium carbonate, i.e., calcite and aragonite (Morse et al. 2007; Ries 2011a, b). Calcite has the lower solubility with a stoichiometric solubility product in seawater K′sp(stoich) of 6.65, whereas aragonite is more soluble (K′sp(stoich) = 4.29, Morse et al. 1980). The solubility of calcite increases with increasing Mg content. The solubility of calcite, with an Mg/Ca of 0.14, is calculated to be equivalent to that of aragonite (Ries 2011b). The physical properties of biominerals outperform abiotic minerals with respect to toughness, hardness, multi-scale ordering, and architecture (e.g., Ma et al. 2009). 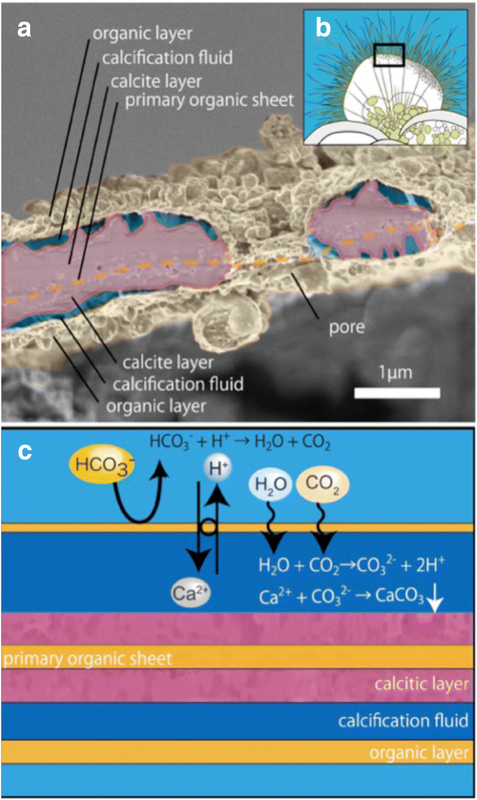 In order to facilitate calcification, biogenic calcium carbonate has the compositional and spatial complexity of inorganic and organic compounds (Tamenori et al. 2014). One example is Mg, an important minor constituent element in the hexagonal calcite structure (Finch and Allison 2008; Branson et al. 2013; Yoshimura et al. 2015), which affects polymorph mineralogy, the rate of crystal growth, and the solubility of calcium carbonate (Davis et al. 2000; De Groot and Duyvis 1966). The skeletons produced by anatomically simple organisms such as corals, macrophytic algae, sponges, and bryozoans are composed of a high-Mg calcite containing > 4 mol% MgCO3 in solid solution. In the modern marine environment, high-Mg calcite and aragonite form via abiotic reactions. Because the presence of Mg2+ in a fluid is known to inhibit calcite crystal growth (Davis et al. 2000; Mucci and Morse 1983), certain taxa such as foraminifera, coccolithophores, mollusks, and brachiopods with skeletons composed of low-Mg calcite (Mg/Ca molar ratio is below 4 mol%) reduce the Mg/Ca ratio in the calcifying solution, and their skeletons are generally more resistant to OA. In the pelagic ocean, up to 80% of the biogenic carbonate is remineralized in the upper water column (Millero 2007). After the remaining portion settles through the water column, the oxidation of OM at the sediment–water interface plays a major role in diagenetic dissolution processes (Eqs. 2 and 4 in Fig. 1). As described in the following sections, the formation and dissolution of carbonates in the context of CO2-induced OA are examined in terms of Ω for a given environment. 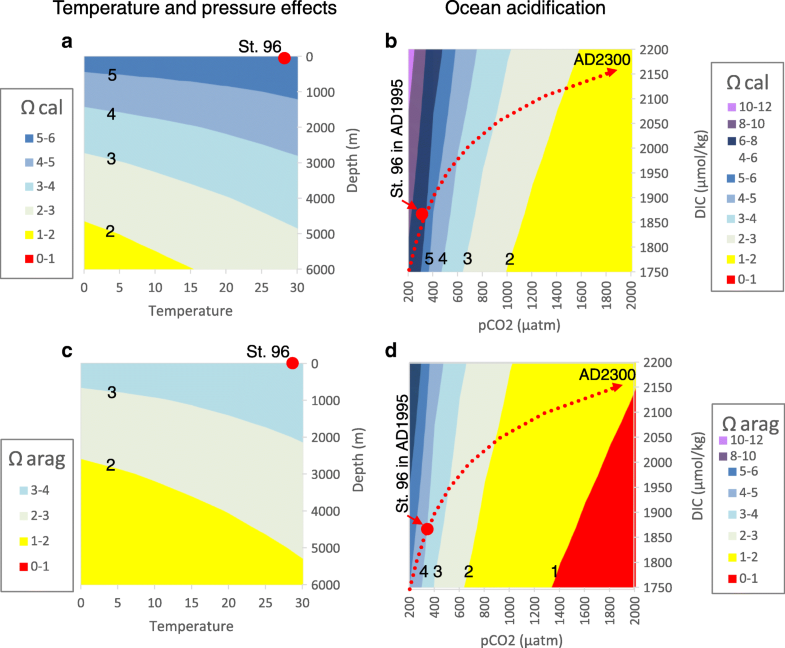 Although differences in the extent of carbonate dissolution in the ocean basins are primarily controlled by seawater pCO2, the use of simple thermodynamic relationships in seawater systems is not always an accurate predictor of biogenic carbonate dissolution due to the complex interplay of mineral surfaces and microbial processes, the presence of reaction inhibitors, the heterogeneity of trace element distribution, differences in the susceptibility of skeletal ultrastructure, and so on (Morse et al. 2007; Cusack and Freer 2008; Iwasaki et al. 2015; Yoshimura et al. 2017). For example, the impact of preferential dissolution is seen in a size-dependent change of the mass fluxes of foraminifera, along with water depth and their relevance to total carbonate flux (Thunell et al. 1983). 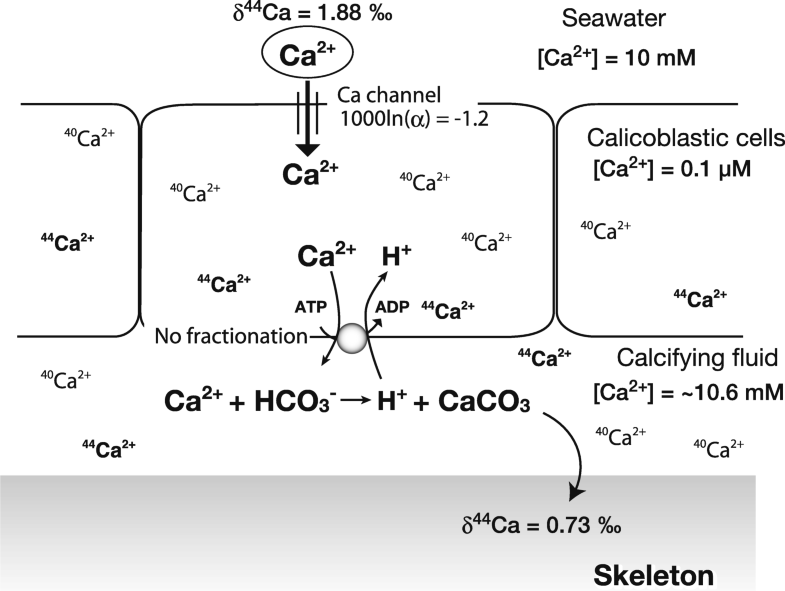 Anthropogenic CO2-driven OA has been reported to pose a severe threat to marine calcifying organisms because the calcification rates of organisms generally decrease in acidified seawater (e.g., Gattuso et al. 1999; Iguchi et al. 2012, 2014; reviewed in Kleypas et al. 2006; Kroeker et al. 2013). Kroeker et al. (2010) conducted a meta-analysis of 149 results (including 18 coral, 1 large-benthic foraminifera, and 15 coccolithophorid studies) and reported generally negative effects on survival, calcification, growth, and reproduction, despite significant variations among taxonomic groups. The work of Kleypas et al. (1999) is widely recognized as one of the pioneering studies focusing on the decrease of coral calcification under the influence of increased atmospheric pCO2, although the term “ocean acidification” was not used in this paper. Since then, experimental studies on calcification versus Ωarag at the level of marine organisms and communities have become more prevalent (Orr et al. 2005). In a recent review, the majority of corals were identified as showing a negative response to a decrease in aragonite saturation (Wittmann and Pörtner 2013). Although some decreases in calcification rates in acidified seawater have been observed among coral species (Ries et al. 2009; Comeau et al. 2014; Iguchi et al. 2014; Sekizawa et al. 2017), some species are insensitive to acidified seawater under certain conditions (e.g., Holcomb et al. 2010; Rodolfo-Metalpa et al. 2010; Chauvin et al. 2011; Ohki et al. 2013; Takahashi and Kurihara 2013; Nakamura et al. 2017). It is suggested that increased pCO2 may facilitate the onset of photosynthesis by increasing HCO3− levels in acidified seawater (Marubini et al. 2008; Comeau et al. 2013). Although the relationship between coral calcification and photosynthesis by symbiotic algae in acidified seawater is not straightforward (Kleypas et al. 2006; Tanaka et al. 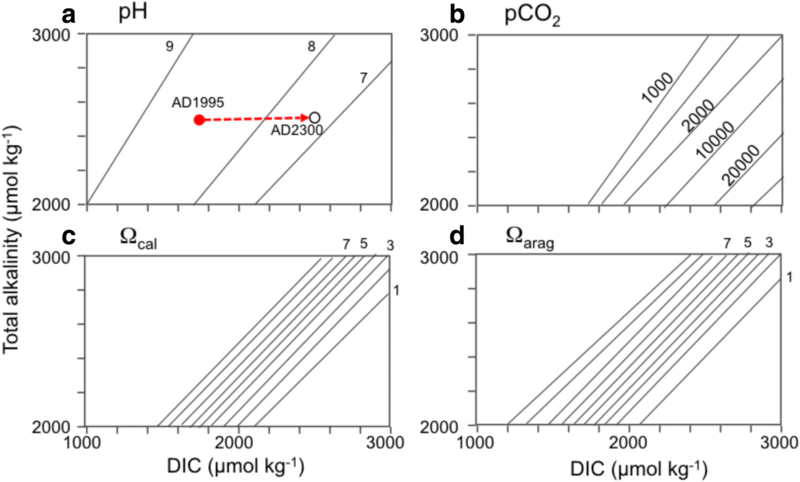 2007), it is evident that increased HCO3− in acidified seawater partially facilitates coral calcification (Marubini et al. 2008; Comeau et al. 2013). The impact of OA on corals has also been studied at the ecosystem level. Kleypas and Langdon (2006) reported that a Ωarag of 3.3 is likely the environmental limit for the existence of tropical coral reefs where calcification exceeds the dissolution of calcium carbonate. Hoegh-Guldberg et al. (2007) discussed possible future coral reef scenarios under rapid climate change and OA and concluded that a pCO2 above 500 ppm presented a high risk to coral reefs, with a potential for the loss of coral-dominated ecosystems. Recently, Cyronak et al. (2018) proposed a biogeochemical approach based on DIC–TA plots to monitor the net calcification potential of coral reef ecosystems under anthropogenic perturbations including ocean warming and acidification. A poleward shift of the northern limit of coral distribution along the Japanese Islands has been reported and attributed to global warming (Yamano et al. 2011). However, OA in temperate waters may influence a northward shift of coral distribution. Recent foraminiferal studies (both planktic and benthic) generally exhibited negative responses to OA (e.g., Russell et al. 2004; Kuroyanagi et al. 2009; Kroeker et al. 2010; Keul et al. 2013). Culturing results showed that shell calcification decreased under low [CO32−]. For example, culture experiments suggested that the higher is [CO32−], the heavier is the shell produced by planktic foraminifera (Orbulina universa) (Bijma et al. 1999). Moreover, the shell weight of Globigerinoides sacculifer increases 2.1–3.6 μg for every 100 μmol kg−1 increase in [CO32−] (Bijma et al. 2002). Although this effect on shell production would be species-specific, the shell weight and calcification rate of both O. universa and G. sacculifer have been shown to exhibit increases under high [CO32−] (Lombard et al. 2010). Keul et al. (2013) also cultured benthic foraminifera (Ammonia sp.) under constant DIC concentrations or constant pH conditions and reported that increased [CO32−] caused increasing size-normalized shell weights and growth rates. Some culturing results have suggested a new perspective on acidification. When we attempt to evaluate the effect of OA on foraminifera, we have to consider (1) that the biological responses to OA differ among different life stages (i.e., gamete, neanic, or mature) and (2) the effect of each carbonate species (i.e., [CO32−], [HCO3−], and [CO2]) on shell calcification. Kroeker et al. (2010) reported that the larval and juvenile phases of marine organisms might be more vulnerable to OA. In fact, cultured juvenile Neogloboquadrina pachyderma (sin.) individuals were more affected by reductions in pH than adults (Manno et al. 2012). Other culturing experimental studies using asexually reproduced individuals have revealed different trends among genera. Hikami et al. (2011) observed opposite responses among two reef-dwelling (large-benthic) foraminifera under different pCO2 culturing conditions, which may have been due to the different symbiotic algae and/or biological-calcification system. The shell weights of two foraminifera, Amphisorus and Calcarina, were controlled mainly by [CO32−] and pCO2, respectively (Fig. 6). Since temperature controls CO2 solubility (i.e., pCO2 and [CO32−]) in seawater, both [CO32−] and temperature affect size-normalized foraminiferal shell weight. Therefore, further work on these two parameters should be carried out to confirm the effect on foraminiferal calcification. Major planktic foraminifera in the tropical/subtropical ocean, such as G. sacculifer, Globigerinoides ruber, and Globigerinella siphonifera, bear photosynthetic symbiotic algae such as dinoflagellates and chrysophycophyte (Schiebel and Hemleben 2017). Large benthic foraminifera, dwelling in warm shallow coral reefs, harbor several microalgae of dinoflagellates, diatoms, red algae, and others as symbionts (Lee and Anderson 1991). Many scleractinian corals that inhabit tropical/subtropical oceans belong to the class Anthozoa of the phylum Cnidaria. They typically live in compact sessile colonies of small individual animals (polyps) that produce hard skeleton structures of aragonite; these are important reef builders. They maintain a symbiotic relationship with photosynthetic dinoflagellate. However, young polyps are not born with dinoflagellate; rather, they obtain algae from the surrounding water column and local sediment. Bleaching is a potentially global threat to marine symbiotic calcifying organisms, especially corals and foraminifera. When stress-caused bleaching is not severe, both have been known to recover. However, if the algae loss is prolonged and the stress continued, both will eventually disappear. An important aspect in relation to the response of coral calcification to environmental changes is the existence of photosynthetic symbiotic dinoflagellates, zooxanthellae (genus Symbiodinium). An association between reef-building corals and their symbiotic algae is essential for coral survival in nature (Yellowlees et al. 2008). In addition, coral calcification is facilitated by the photosynthesis of symbiotic algae (Gattuso et al. 1999). Therefore, it is necessary to consider the existence of symbiotic algae when we evaluate the effects of environmental changes on coral calcification. Coral calcification is closely related to coral growth, which is an essential characteristic of their life history; thus, a decrease in coral calcification would lead to negative impacts by causing difficulties in maintaining coral life histories. In relation to the responses of corals to environmental changes, the most significant phenomenon is coral bleaching (e.g., De’ath et al. 2009) (Fig. 7). The effect of seawater temperature on corals has been well studied because high seawater temperature is known to be a main factor causing the collapse of coral–algal symbiosis, which is followed by coral death (reviewed in Hoegh-Guldberg 1999). As to the cause of coral bleaching, it is suggested that higher temperature induces oxidative stress in corals. In regards to coral calcification, the increase in seawater temperature facilitates calcification within a range of mild temperatures (Inoue et al. 2012). Based on the observation of skeletal oxygen isotope (δ18O) and carbon isotope (δ13C) microprofiles in coral cores, Suzuki et al. (2003) reported that severe coral bleaching inhibited coral calcification of a massive Porites colony in 1998. Also based on coral cores, De’ath et al. (2009) suggested that increased temperature stresses suppressed the coral calcification of massive Porites on the Great Barrier Reef, although it is thought that other environmental factors were likely related to the suppression. Using coral cores of Diploastrea heliopore, Cantin et al. (2010) reported that increased seawater temperature decreased coral growth. Laboratory rearing experiments have also clarified variations in the calcification patterns of corals in certain temperature regimes (Anthony et al. 2008; Inoue et al. 2012). For example, Nishida et al. (2014a) reared coral nubbins of an encrusting coral, Isopora palifera, under various temperature treatments and found that calcification was suppressed in higher temperature treatments (> 31 °C). It is known that there are variations in sensitivity to heat stress among species (namely, the winners and the losers in coral bleaching; Loya et al. 2001; van Woesik et al. 2011). Morphological (e.g., branched, flat; Loya et al. 2001) and/or physiological variations (e.g., symbiont type, energy availability; Baird et al. 2009) among species would contribute to different susceptibilities to heat stress. However, studies on calcification responses to seawater temperature among species remain limited. The difficulty in understanding the complicated responses of coral calcification is partly attributed to the fact that coral calcification is closely related to coral–algal symbiosis, which forces us to consider both the coral host and the symbiotic algae. Thus, separating the coral host and symbiotic algae under experimental conditions would be helpful to better understand the responses of coral calcification to environmental changes. Acropora species release their gametes into seawater in a mass spawning event in early summer. The eggs do not include symbiotic algae but Acropora species incorporate symbiotic algae mainly after their settlement. Thus, if we culture coral planulae and induce their settlement under artificial conditions using filtered seawater, which does not contain symbiotic algae, we can easily produce aposymbiotic polyps. Furthermore, we can also induce the infection of symbiotic algae for aposymbiotic polyps by adding symbiotic algae using an artificial method. Thus, this coral primary polyp system enables us to experimentally separate the association of symbiotic algae from their coral host and also allows us to determine which stage of the calcification process is sensitive to environmental changes (Inoue et al. 2012; Tanaka et al. 2013, 2014; Nishida et al. 2014b). Using this system, we attempted to evaluate how seawater temperature and acidification affect coral calcification from the perspective of both the coral host and the symbiotic algae. In the case of the calcification responses to temperature, the responses were clearly different between aposymbiotic and symbiotic polyps. The peak of calcification in symbiotic polyps was around 29 °C while that in aposymbiotic polyps was around 31 °C. Considering the fact that the calcification of aposymbiotic polyps increased at 31 °C, the tolerance of the coral host to thermal stress seems to be higher, as compared with the symbiotic condition. In the case of calcification responses to seawater acidification, calcification tended to decrease according to the increase of pCO2 in both aposymbiotic and symbiotic polyps; however, the calcification of adult branches was not decreased at higher pCO2 conditions (Ohki et al. 2013). The fertilization effect of increased pCO2 on coral calcification may differ across life stages. In addition to the advantage described above, the coral primary polyp system has certain further advantages for evaluating the calcification responses of corals, as compared with experiments using the adult branches of corals. Primary polyps are very small and the calcification of primary polyps is visibly fast; therefore, a sufficient number of specimens is easily available. As such, the application of live tissue imaging to the coral primary polyp system would facilitate our understanding of the calcification responses of corals to various environmental factors (Ohno et al. 2017a, b). Bleaching in algal symbiont-bearing, large benthic foraminifera was first observed in laboratory experiments in Amphistegina spp. in the early 1980s, and it was first noted in 1988 in field populations of Amphistegina gibbosa in the Florida Keys. Since 1991, bleaching in Amphistegina populations has been observed in subtropical reefs worldwide (Hallock et al. 2006). Bleaching in Amphistegina appears as partial “mottling” (small white spots) that is uniformly pale or extensively white (Hallock et al. 2006). Cytological studies indicate that bleaching in Amphistegina is caused by the loss of photosynthetic microalgae and/or their photopigments; it is due to the digestion of deteriorating symbionts by the host (Talge and Hallock 2003). Experimental studies suggest that bleaching in Amphistegina is induced by photoinhibitory stress, in particular by the shorter (300–490 nm) wavelengths of solar radiation (Williams and Hallock 2004). Temperature stress is also related to foraminiferal bleaching. In culture experiments, Talge and Hallock (2003) found that bleaching in Amphistegina occurred more intensively when incubated at 32 °C than at 25 °C, indicating that bleaching was enhanced by elevated temperature with photic stress. Later, Schmidt et al. 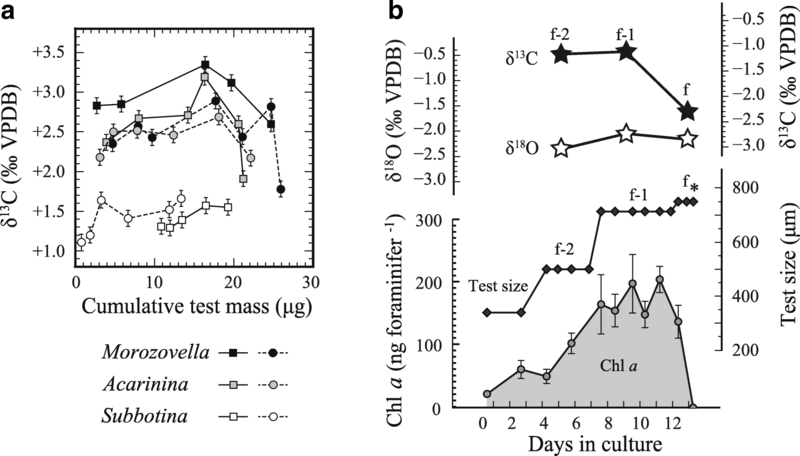 (2011) demonstrated bleaching (the loss of photopigments) and decreased photosynthetic efficiency in other diatom symbiont-bearing foraminiferal species (Amphistegina radiata, Heterostegina depressa, and Calcarina hispida) under high temperature stress (> 30 °C). Subsequent similar experimental studies confirmed bleaching and reduced photosynthetic efficiency in many other symbiont-bearing foraminiferal species under high temperature stress (e.g., van Dam et al. 2012; Fujita et al. 2014; Schmidt et al. 2014). As summarized in Sheppard et al. (2009), bleaching at elevated temperature is related to the photoinhibition of algal symbionts. Temperature limits the rate of electron transport in photosystems and the turnover of associated D1 proteins. As a result, the rate of excitation (light capture by reaction centers) exceeds the rate of light utilization (photochemistry). This excess energy results in a buildup of reactive oxygen species (ROS). The overproduction of ROS causes damage to the photosynthetic apparatus of symbionts as well as to host cells. A meta-analysis of available experimental data up to the year 2014 (Doo et al. 2014) showed a negative trend between growth and photosymbiont health under a + 4 °C warming scenario, as compared with the present-day condition (Fig. 8). Host foraminifera became inactive, grew slowly, and tended to have increased mortality (Fig. 8a). Algal endosymbionts, irrespective of symbiont type, exhibited (i) decreased concentrations of chlorophylls and other photopigments, (ii) a decline in the maximum quantum yields of Photosystem II (PSII; Fv/Fm) and other photophysiological parameters, (iii) reduced numbers of viable symbionts and high numbers of deteriorating symbionts, and (iv) decreased levels of RuBisCO protein (the enzyme responsible for fixing CO2). Foraminiferal–algal associations (as holobionts) exhibited bleaching, decreased net O2 production rates, increased respiration rates, decreased organic carbon (C) and nitrogen (N) contents, and decreased molar C/N ratios (summarized in Fujita et al. 2014). This negative trend in foraminiferal responses is supported by culturing experimental studies conducted after that of Doo et al. (2014) (e.g., Sinutok et al. 2014; Prazeres et al. 2016; Schmidt et al. 2016). These experimental studies suggest that combined temperature and light stresses induce the inactivation of photosystems, bleaching, and reduced energy storage. This damage to algal symbionts results in a lack of movement, reduced growth, changes in symbiont genotypes, increased susceptibility to bacterial/algal infection, disease, and finally death of the host foraminifera. Thus, bleaching and associated photophysiological parameters in algal symbiont-bearing foraminifera would be useful as a sensitive bio-indicator of ocean warming. Results of the meta-analysis also imply that diatom symbionts appear more resilient than dinoflagellate symbionts under ocean warming (Fig. 8b). A meta-analysis for OA scenarios also suggests that hyaline taxa with diatom symbionts appear more resilient than porcelaneous taxa with dinoflagellate symbionts (Doo et al. 2014). These contrasting differences in host growth and photosymbiont health between two foraminiferal taxa with different algal symbionts will likely result in the dominance of hyaline foraminifera over porcelaneous foraminifera in symbiont-bearing reef foraminiferal communities in the future, as well as the geographical expansion of the former taxa to higher latitudes (Weinmann et al. 2013). 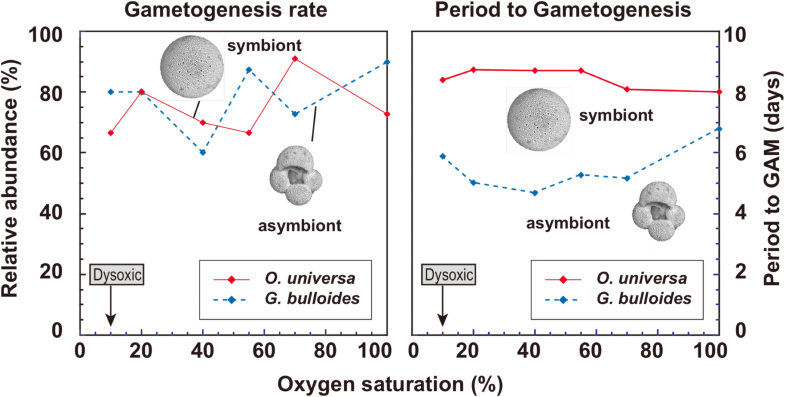 The resilience of diatom symbionts over dinoflagellate symbionts under ocean warming may also partially explain the dominance of large benthic foraminifera during the warm period of the Cenozoic. During the Paleogene, hyaline rotaliid taxa such as Nummulites dominated and diversified in tropical to subtropical carbonate environments (Hallock 2000). Based on the fact that their modern descendants host diatom symbionts, these extinct hyaline taxa possibly harbor diatom symbionts (Lee 1998). Thus, a warm, high CO2 world in the geological past was likely favored by hyaline taxa with diatom symbionts but not by porcelaneous taxa with dinoflagellate symbionts, as suggested by Hallock (2000) and Fujita et al. (2011). In order to estimate future response of corals and foraminifera to OA, it is important to understand the basic mechanism of small-scale calcification. Screlactinian corals are important in terms of marine biodiversity and the reconstruction of climate change in the past. Since the acidification of seawater affects coral skeletons through physiological coral activities, culture experiments using screlactinian corals under acidified seawater have been conducted. In particular, as substantial recruitment is critical for the persistence of coral reef ecosystems (Hughes and Tanner 2000) and primary polyps of coral are highly susceptible to the potential effects of OA (Kurihara 2008; Suwa et al. 2010), investigations on the growth of the primary polyp skeleton have been conducted (Albright et al. 2008; Inoue et al. 2011; Ohki et al. 2013). Before discussing the influence of OA, we present the latest hypothetical models to make the process of biomineralization easily understandable. Hohn and Merico (2012, 2015) classified the many proposed ideas into four different hypotheses that reflect alternative realizations of ion transport in corals (Fig. 9). Hypothesis 1 (H1) states that only transcellular ion transport of Ca2+ and HCO3− into the calcifying fluid induces coral calcification (Allemand et al. 2004) (Fig. 9a). Hypothesis 2 (H2) proposes that Ca2+ and carbon are supplied only by the paracellular pathway (Gagnon et al. 2012). In hypothesis 3 (H3), protons are removed from the calcifying fluid to increase aragonite saturation by a proton pump while Ca2+ is transported into the calcifying fluid passively via the paracellular pathway, known as the proton flux hypothesis (Jokiel 2011; Ries 2011a). In hypothesis 4 (H4), a combination of transcellular and paracellular ion transport can induce coral calcification (Cohen and McConnaughey 2003; Nakamura et al. 2017). Hohn and Merico (2015) examined the plausibility of different calcification mechanisms in relation to OA using a mathematical model. The results suggest that H4 and a combination of the processes in H1 and H2 are consistent with changes in calcifying fluid pH and Ca concentration and with calcein staining experiments. An efflux of Ca2+ and CO32− from the calcifying fluid is generated by the paracellular pathway, which results in a leakage of ions that counteracts the concentration gradients maintained by the transcellular pathway. Future ocean acidity would exacerbate this carbonate leakage and reduce the ability of corals to accrete CaCO3. However, this result was obtained by computer simulation and was not confirmed by observations in field and culture experiments. Ca isotopic work could provide some clarification on this issue. It has been suggested that acidified seawater significantly decreases the growth rate of primary polyps, as reported for adult corals. However, recent studies suggest that corals regulate their internal pH and then counteract any acidification (Ohno et al. 2017a; McCulloch et al. 2012). In fact, the mechanism by which corals control the transport of Ca2+ and other ions from seawater are largely unknown. Corals build their skeletons using extracellular calcifying fluid located at the tissue–skeleton interface. In terms of coral calcification, Ca2+ and CO32− must be constantly supplied to the calcifying fluid to precipitate aragonite skeletons. It has been suggested that Ca-ATPase controls the saturation state of aragonite in the calcifying fluid as the pump transfers Ca2+ in exchange for H+ across the calicoblastic cells leading to high calcification rates in the calcifying fluid (Fig. 9; Al-Horani et al. 2003; Cohen and McConnaughey 2003). Although there is no transporter known for carbonate, carbon can cross the coral cells via free diffusion of CO2 over cell membranes. Then, the CO32− ion can be resupplied because once CO2 or HCO3− reaches the calcifying fluid, a new chemical equilibrium between CO2, HCO3−, and CO32− is established. These pathways are called transcellular pathways since Ca2+ and carbon must pass through the coral cells. However, there are several reports suggesting that seawater may also enter the calcifying fluid directly, mainly based on experiments using a membrane impermeable dye (Cuif et al. 2011; Gagnon et al. 2012). In order to estimate the transport of Ca2+ by the Ca-channel and Ca-ATPase, Ca isotopes (44Ca/40Ca) in screlactinian corals (Acropora sp. and Porites australiensis) have been measured and + 0.4‰ offset compared to inorganic aragonite was found (Böhm et al. 2006; Inoue et al. 2015) (Fig. 10). The offset suggests that Ca2+ is transported into calcifying fluid mainly via a transcellular pathway (Fig. 10), although this does not imply that there is no direct transport (paracellular pathway) of other ions from seawater to the calcification site. As mentioned previously, the relative contribution of ion transport (transcellular or paracellular pathways) to coral calcification has been estimated (Hohn and Merico 2015), indicating the importance of transcellular transport, which is always directed into the calcifying fluid. However, there also exists carbonate leakage, which appears to yield greater difficulty in accreting calcium carbonate. Inoue et al. (2015) further investigated the relationship between the isotope fractionation of Ca in coral skeletons and the environment (temperature, seawater pH, and light intensity) using cultured corals. As a result, only temperature affected δ44Ca in Porites corals and its temperature dependence was 0.02‰/°C. Interestingly, negligible changes in isotopic fractionations of Ca were found in the pH and light intensity experiments, whereas significant differences in skeletal growth rate were observed in both experiments. Therefore, the transport path of Ca2+ and its activity might have a minor impact on skeletal growth; instead, carbonate chemistry in the fluid would predominantly control the precipitation rate, as suggested by Hohn and Merico (2015) (Fig. 9). Foraminiferal regulation of Ca2+ and CO32− uptake into calcareous tests are of great interest to scientists studying OA and its history. The calcareous foraminifera consist of two groups, porcelaneous (miliolid) and hyaline, according to their test structure. Porcelaneous species produce calcite in the form of needles with a length of a few μm in cellular vesicles (Parker 2017). The walls of these species exhibit an opaque appearance like porcelain. Hyaline species precipitate chamber walls extracellularly on primary organic sheets. These are constructed prior to calcification as a new chamber that provides nucleation sites for the initial calcite precipitation (as reviewed by Erez 2003). The crystallography of the porcelaneous and hyaline species differs from each other, as do their calcification pathways. The porcelaneous species have high Mg-calcite (Toyofuku et al. 2000; Maeda et al. 2017), whereas most hyaline species produce low Mg-calcite. The variability in Mg level can be explained by differences in the cytological pathway of Ca uptake (de Nooijer et al. 2009a). Porceallaneous species form imperforate shells, whereas hyaline species form perforate shells (Ottway et al. 2018). Since their solubility differs depending on crystallography, the responses of porcelaneous and hyaline species to OA differ markedly. As a result of culture experiments with large foraminifera, the tests porcelaneous species were dwarfed, whereas hyaline species showed no uniform response among the species (Kuroyanagi et al. 2009; Fujita et al. 2011; Hikami et al. 2011). Among recent foraminifera, Hoeglundina and Ceratobulimina are known to have aragonitic tests (Bandy 1954). Since aragonite has greater solubility than calcite, it is presumed to be strongly affected by acidification; however, there are apparently no studies to confirm this hypothesis. Evaluation of the influence of OA on these aragonitic species is a future research need. Based on isotope labeling experiments, calcification by foraminifera is hypothesized to involve intracellular storage of Ca2+ ions and inorganic carbon (ter Kuile et al. 1989; Erez 2003). Foraminifera are also considered to manipulate pH (de Nooijer et al. 2009a; Bentov et al. 2009; Toyofuku et al. 2017), uptake Ca (Erez 2003; Toyofuku et al. 2008), and/or control Mg (Bentov and Erez 2006) via cytological functions. The elemental and isotopic composition of foraminiferal calcareous tests has also constrained models for calcification (Elderfield et al. 1996; Bentov and Erez 2005). Recently, visualization methods using variable fluorescent indicators have become powerful tools for revealing the biomineralization process of foraminifera (Toyofuku et al. 2008; de Nooijer et al. 2008, 2009a, b; Bentov et al. 2009; Ohno et al. 2016; Toyofuku et al. 2017). The variety of results and partly contradicting hypotheses and models for foraminiferal calcification make it essentially impossible to predict their response to OA and enrichment of dissolved CO2 (de Nooijer et al. 2014). Indeed, the foraminiferal responses to OA are varied among species (Kuroyanagi et al. 2009; Fujita et al. 2011; Hikami et al. 2011; Keul et al. 2013). Fluorescence observation has revealed that management of protons is important for foraminiferal calcification and for corals (e.g., Cai et al. 2016). The hyaline benthic species, Ammonia sp., show a large pH variation (~ 2 units) between the inside and outside of the site of calcification during the chamber formation process (de Nooijer et al. 2009a; Glas et al. 2012; Toyofuku et al. 2017). Visualization of the extracellular pH distribution around individuals shows that chamber formation is accompanied by a strong decrease in external pH from ambient to ~ 7 (Fig. 11). Meanwhile, the highest pH reaches more than 9 within the site of calcification. This decrease in external pH was observed over a wide range of pCO2 (from 460 up to 9010 μatm /from pH 8.0 to 6.8) and the reduction in pH compared to that of the ambient seawater was relatively constant over the experimental conditions. The observed decrease in pH outside the site implies that these foraminifera actively pumped out protons via a physiological process, with the flux independent of initial external pCO2/pH. Under observation in the presence of a proton pump inhibitor (Bafilomycin A1), the external pH gradient disappeared (Toyofuku et al. 2017). Further, the specimens could no longer accomplish calcification. It is strongly suggested that proton transport is essential to the foraminiferal calcification process. Perhaps this is due to the conjugation of protons and Ca2+ exchange by an antiporter. These findings also suggest that the site of calcification of this species is well isolated from the ambient environment. Recently, these considerations have been supported by SEM observation on the site of calcification of Ammonia (Nagai et al. 2018; Fig. 12). The coverage of a thin layer (~ 1 μm) of a pseudopodial sheet extending over the entire specimen may be a strategy for maintaining oversaturation close to the chamber surfaces. As a consequence, the site of calcification may extend toward the pre-existing chambers and produce a thin layer of calcite over the pre-existing chambers to construct a unique multi-lamellar structure (Reiss 1958; Bé and Hemleben 1970; Grønlund and Hansen 1976). Proton pumping in the calcification of Ammonia sp. Ammonia sp. are widely distributed in many coastal environments, including tidal flats, ports, and brackish lakes. Because of its resistance to a wide range of environmental variables, it is a genus popularly employed in laboratory cultures. It is also used to study geochemical signatures as a function of physical and chemical conditions. Further, Ammonia sp. serve as model species, whose chamber wall structure resembles that of many Rotalid species. The calcification of Ammonia sp. is characterized by strong gradients in pH and/or pCO2 between the site of calcification and the foraminiferal microenvironment. The results suggest that foraminiferal calcification would be regulated by DIC concentration rather than the calcite saturation state (Fig. 12). This uncoupling of saturation state and calcification explains the moderate response of many foraminifera to OA and the occurrence of calcareous foraminiferal communities at undersaturated conditions with respect to calcite but at high DIC concentrations (Keul et al. 2013; Flako-Zaritsky et al. 2011). The reduction in oceanic pH by increased oceanic CO2 uptake is relatively small compared with the pH decrease in the microenvironment during Ammonia’s calcification. Hence, a relatively moderate decrease in pH may not impair foraminiferal calcification. Proton pumping is found to be the fundamental strategy for a variety of marine calcifiers (Ries 2011a). 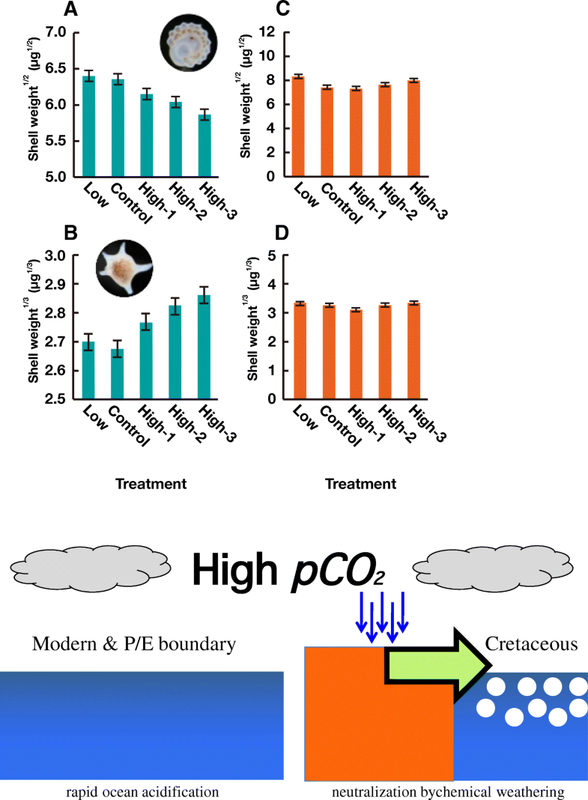 The high internal pH and large internal–external pH gap associated with foraminiferal calcification predicts that they may well produce more carbonate ions at the site of calcification even under elevated pCO2. A more severe influence of OA can be found in the deep sea, where carbonate tends to dissolve due to its higher solubility. This is controlled by the solubility product, which increases with depth (pressure), and by the increased acidity caused by the degradation of OM (Figs. 1 and 4, Table 1). The distribution of carbonate in marine sediment is inhomogeneous (e.g., Archer 1996). For example, regions with high carbonate content are mostly in the shallow oceanic ridges, whereas the deep ocean basins are almost completely devoid of carbonate due to its dissolution as a result of the high pressure, high [CO2], low temperature, and hence, low saturation state (Eq. 4 in Fig. 1). These two realms are separated by a transition zone spanning several hundreds of meters in water depth, over which the carbonate content drops toward zero. The upper limit of the transition zone is termed the lysocline and lower limit of the transition zone is termed the carbonate compensation depth (CCD) (Fig. 4). In the deep sea, the degree of seawater acidity also increases with the age of the water mass because of accumulating CO2, nitrate, and phosphoric acid derived from decomposed OM. Therefore, the depth of the transition zone is essentially influenced by deep water properties via thermohaline circulation and it becomes shallower as the age of the deep water increases (Broecker and Takahashi 1977). Actually, the sedimentary carbonate content in the Atlantic Ocean is generally higher than that of the Pacific Ocean. In particular, the carbonate content is almost zero in the North Pacific below 4000 m. Most carbonate is dissolved in the deep sea in the North Pacific regardless of the high carbonate export flux (e.g., Kawahata 2002). The change in depth of the transition zone must be highly correlated with DIC and alkalinity contents in the global ocean (Figs. 2 and 4). Therefore, the dissolution and preservation of calcite play an important role in the global carbon cycle. Several proxies for carbonate dissolution have been proposed based on planktic foraminiferal shells. Berger (1968) proposed a dissolution index based on empirically ranked species of planktic foraminifera because they have a variety of morphologies and some of them are fragile and prone to dissolution. Similarly, benthic foraminifera normally have thick and smooth shells that are more resistant to dissolution than those of planktic foraminifera. Therefore, the planktic to benthic foraminiferal ratio in the sediment has been suggested as a dissolution proxy (Peterson and Prell 1985). However, the results depend on the initial makeup of the foraminiferal population in the sediment at the regional scale. The ratio of foraminiferal fragments to whole shells has been widely used as a calcite dissolution index (Peterson and Prell 1985). The advantage of the fragment ratio is its simplicity; however, its determination is often subjective. These methods are not calibrated against present-day pressure-normalized [CO32−]. The size-normalized shell weight of planktic foraminifera, which was first proposed by Lohmann (1995), is the most widely used method to reconstruct past [CO32−]. Shell wall thickness and shell bulk density can be estimated using this method. A linear relationship between size-normalized shell weight and bottom-water calcite saturation state has been suggested (Broecker and Clark 2001, 2002). This method is based on an empirical calibration of bottom water [CO32−] or Ωcal, with the average weight of clean shells of selected species picked from narrow size ranges in core-top samples (e.g., de Villiers 2005). However, Barker and Elderfield (2002) showed that thickness of the foraminiferal shell walls varies with growth conditions. Spero et al. (1997) found strong correlations between shell weight and both water temperature and [CO32−]; the warmer the water and the higher its [CO32−], the thicker the shells. Therefore, size-normalized shell weight techniques have uncertainties owing to the initial shell weight variation depending on Ω in the surface water. 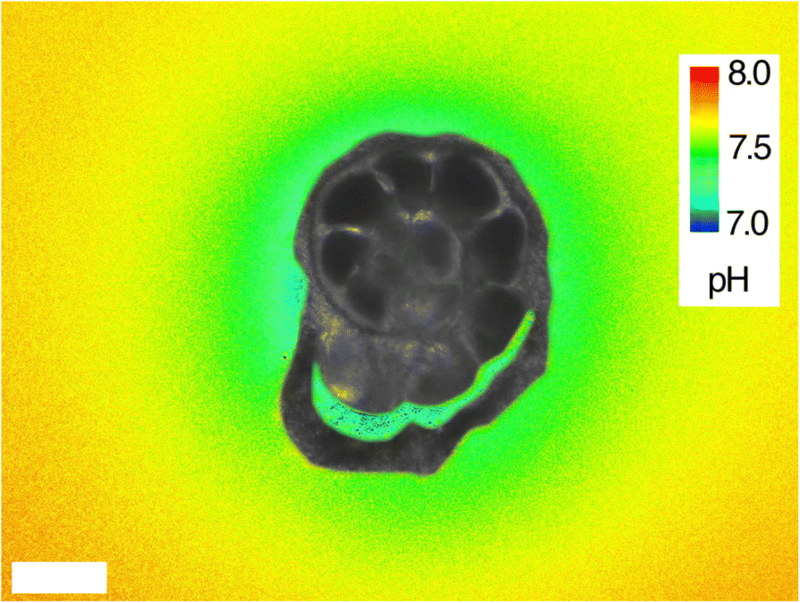 Recent progress in X-ray micro-computed tomography (XMCT) has allowed researchers to observe the internal structures of foraminiferal shells and to evaluate shell dissolution intensity. Johnstone et al. (2010) used an XMCT scanner to observe the dissolution of foraminiferal shells from core top sediments and suggested that foraminiferal shells dissolve from the inner chamber walls and that the initial dissolution cannot be observed from outside of the shells. Furthermore, they divided the dissolution process of foraminiferal shells into five stages and proposed a new empirical dissolution index, XDX, based on the appearance of the CT images, and they provided a calibration to estimate ΔM (the loss of test mass due to dissolution) from XDX. In addition, XMCT makes it possible to quantitatively estimate shell density, and to observe a high-resolution density distribution in an individual shell. Iwasaki et al. (2015) used an XMCT scanner to estimate foraminiferal shell density and performed time series dissolution experiments with tests of planktic foraminifera, G. bulloides, in pH-controlled undersaturated seawater in order to observe the initial stages of the dissolution process of G. bulloides tests (Fig. 13). They employed an XMCT system (ScanXmate-D160TSS105/11000, Comscantecno Co. Ltd., Kanagawa, Japan) to investigate the internal structure and density distribution of the shells. A high-resolution setting (X-ray focus spot diameter of 0.8 μm, X-ray tube voltage of 80 kV, detector array size of 2000 × 1336, 1500 projections/360°, 2.5 s/projection) was used for three-dimensional (3-D) quantitative densitometry of small foraminiferal shells. The CT number, which is the normalized value of the calculated X-ray attenuation coefficient of a voxel in a computed tomogram, was used as an indicator of calcite density. In their study, comparison of CT and SEM images of the cross section of the outermost chamber of G. bulloides revealed that the inner calcite layer has a porous microgranular crystalline structure (low-density) and the outer calcite layer has a euhedral crystalline structure (high-density). From their time series dissolution experiment, dissolution of the G. bulloides shell started from the central area of the shell and then spread to the porous inner calcite layer. In contrast, the outer calcite layer with a euhedral crystalline structure was resistant to dissolution and was well preserved (Fig. 13a, b). Such selective dissolution of the porous inner calcite layer was also evident as changes in the histogram of the CT numbers. Using changes in the CT number histogram with the progression of shell dissolution, a quantitative proxy that allows quantitative measurements of carbonate loss from foraminiferal tests prior to carbonate dissolution was provided, which is not influenced by initial shell condition. 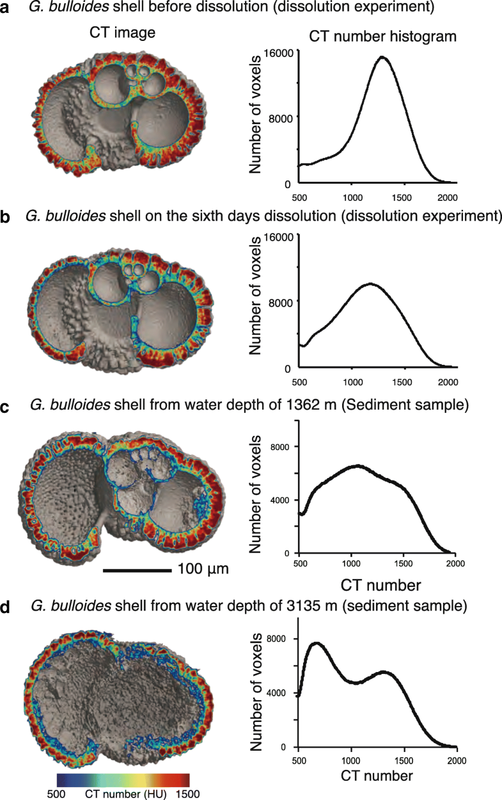 Selective dissolution of the inner calcite layer and changes in the CT number histogram were also observed in G. bulloides shells from marine sediment samples (Fig. 13c, d), suggesting that the dissolution proxy based on XMCT scanning might be applicable to estimate the amount of carbonate dissolution at the deep-sea floor. Furthermore, characteristics of the shell dissolution process, accompanied by changes in the micro-scale crystalline structure, should be applicable to various species other than G. bullloides. Although several problems remain to be addressed (e.g., the time required for scanning and the imperfect understanding of the dissolution mechanism in the water column and in deep-sea sediments), a dissolution proxy utilizing the CT number histogram based on XMCT scanning has the potential to be the first viable method for accurately estimating the actual amount of calcite in seawater [CO32−]. The Earth’s surface has previously experienced a high pCO2 environment, which was generally associated with “hot house” conditions. Carbonate in the deep-sea was abruptly dissolved at the Paleocene/Eocene boundary due to severe OA. However, especially in the warm Cretaceous, abundant carbonate precipitated at the seafloor. These observations clearly demonstrate that high pCO2 alone did not always result in OA. The mid-Cretaceous is widely accepted as the archetypal ice-free greenhouse interval in Earth’s system history. To understand the greenhouse climate system, the Cretaceous paleoclimate has been widely discussed in relation to geological, geochemical, and paleontological records. Since early reports of mid-Cretaceous tropical and subtropical plants from the northern high latitude (e.g., Nathorst 1911), many paleontological studies have described a warm climate even at high latitudes (e.g., Tarduno et al. 1998). This warm climate is attributable to high pCO2 and possibly methane levels, in association with the high production rate of oceanic crusts, enhanced continental rifting, formation of large igneous provinces (LIPs), and metamorphic decarbonation (although volcanic activities releasing volcanic dust sometimes act as cooling events) (e.g., Larson 1991; Kuroda et al. 2007; Moriya 2011; Scudder et al. 2016; Brune et al. 2017). The extensive warmth observed during the mid-Cretaceous is also supported by the oxygen isotopic paleothermometry of well-preserved planktic foraminifera (so-called glassy foraminifera) (e.g., Wilson et al. 2002; Moriya et al. 2007; Bornemann et al. 2008; Friedrich et al. 2008). However, the Cretaceous equatorial sea surface temperature (SST) estimated in twentieth-century studies was less than 25 °C, which is much lower than it should be and even lower than the modern equatorial temperature. The highest SST of 29 °C in the modern ocean is observed in the Western Pacific Warm Pool (WPWP) (Fig. 14). From the surface, water temperature decreases vertically downward to ~ 1 °C at the bottom of the modern equatorial Pacific, with a steep thermocline at 100–300 m, indicating that the water column is well stratified in the modern equatorial ocean. Compared with the SST in the WPWP in the last glacial maximum, a value of ~ 25 °C in the Cretaceous greenhouse world is surprisingly cool. This cool equatorial condition in the greenhouse world is termed the Cool Tropic Paradox (D'Hondt and Arthur 1996). At the beginning of the twenty-first century, Pearson et al. (2001) found that early diagenesis on or just under the sea floor lowers the isotopic temperatures recorded in foraminiferal fossils. While many authors in the twentieth century utilized foraminiferal fossils with minor recrystallization for isotopic thermometry, new data generated from extremely well-preserved “glassy” foraminifera conclusively indicated that SSTs of the Cretaceous greenhouse were extremely high. Isotopic records show that mid-latitude SSTs of ~ 25 °C were higher than the modern mid-latitude temperature (Fig. 14). The difference between the modern and Cretaceous SSTs becomes prominent in the Cenomanian–Turonian (~ 95 Ma), which appears to have been the warmest interval on Earth for at least the last 100 million years (e.g., Wilson et al. 2002). Background equatorial SSTs in this interval were ~ 35 °C and the highest SST exceeded 37 °C, indicating the cirrus cloud negative-feedback hypothesis proposed for the modern ocean might not be valid, or that it had another steady state in the ice-free greenhouse system. Although SSTs became cooler in the late Cretaceous, equatorial and mid-latitude SSTs were still higher than those of the modern ocean. The other notable disparity was a significantly weak meridional SST gradient in the Cretaceous. This was especially obvious in ~ 90 Ma (Fig. 14). While the Cretaceous SST gradient between the equator and 60° in latitude is ~ 14 °C, the gradient in the modern ocean is ~ 25 °C. This observation indicates enhanced heat transport from the equator to the poles in the Cretaceous greenhouse system. However, since numerical examinations (e.g., general circulation models) cannot simulate this weak SST gradient with reasonable pCO2, unknown heat transporting mechanisms in the greenhouse system or high concentrations of other greenhouse gases, such as methane, are expected (Bice et al. 2006). On the other hand, fully coupled models (e.g., CCMS [Community Climate System Model], MIROC [Model for Interdisciplinary Research on Climate], etc.) have been addressing this important problem. Upchurch et al. (2015) first succeeded in describing the weak meridional SST gradient without unreasonable artificial tuning. This significant advancement is opening the door to understanding the greenhouse climate system in collaboration with multi-site and -depth proxy archives. It is well known that in the mid-Cretaceous, the greenhouse period, oceanic anoxic events (OAEs) occurred several times (e.g., Jenkyns 2010) due to the lower solubility of oxygen into the seawater at higher SST and lower ventilation of the water mass. One of the most interesting features of the anoxic sediments is that large quantities of organic carbon were often deposited in association with carbonates (e.g., nannoconid, foraminifera). In fact, well-preserved planktic foraminifera have been discovered from the black shale collected from ODP Site 1049 in Tethys (Norris and Wilson 1998), indicating that carbonate was not significantly dissolved even in suboxic or anoxic waters. The oceanic redox state is a critical determinant in the evolutionary history of life on Earth (Raup and Sepkoski 1982). High turnover rates of fossil planktic species (planktic foraminifera and calcareous nanofossils) and radiolaria dwelling in the mid-water column have been observed at or near these OAEs (Leckie et al. 2002; Itaki 2016), although the critical boundary conditions for the survival of planktic foraminifera under low-oxygen concentrations remain obscure. Culture experiments have examined the direct effects of dissolved oxygen concentration on planktic foraminifera. Kuroyanagi et al. (2013) cultured planktic foraminifera (both symbiont and non-symbiont species) under different oxygen levels. These foraminifera can survive, add chambers, feed, and undergo gametogenesis even under dysoxic conditions (~ 0.7 mg O2 L−1 or ~ 22 mmol O2 m−3). Furthermore, the gametogenesis rate and time to gametogenesis did not show any obvious trends across oxygen levels (Fig. 15). On the other hand, other results from the culture experiments showed that no planktic foraminifera could survive for more than 48 h in the presence of H2S (~ 2 and ~ 9 mg H2S L−1) (Kuroyanagi et al. 2019). Thus, critical boundary conditions for the survival of planktic foraminifera under low-oxygen concentrations are still unknown due to the difficulty of maintaining extremely low oxygen levels throughout a culture. Several studies have reported changes in oxygen-minimum zone conditions corresponding to planktic foraminiferal disappearance in Quaternary sediments (Fenton et al. 2000; Reichart et al. 2004). Under a “business-as-usual” scenario, modeling results have revealed a dramatic 50% increase in the suboxic water volume due to more stratified surface water with higher CO2 levels until 2100 AD (Oschlies et al. 2008). Therefore, culturing planktic foraminifera under suboxic water conditions (0 to ~ 20 mmol O2 m−3) might provide essential information and contribute to estimating changes in the future global carbon cycle. The Eocene epoch is characterized by overall warmth, with a gradual cooling trend and short-term hyperthermal events. The SST at low latitudes was estimated to be as high as 30–35 °C (Pearson et al. 2007). Especially during the extreme warmth of the middle Eocene climatic optimum (MECO) event, pCO2 increased by a factor of 2 to 3, and SST rose by 3–6 °C to exceed 28 °C even in southern high latitudes (Bijl et al. 2010). Such conditions might be disastrous to photosymbiotic organisms based on our current knowledge on modern coral “bleaching,” i.e., a collapse of photosymbiosis, via heat stress. It is pointed out that symbiont “bleaching” might have also occurred in planktic foraminifera. The photosymbiotic ecology of planktic foraminifera can be detected even from fossils with stable isotopic signatures of symbiont photosynthesis recorded in foraminiferal tests (Oppo and Fairbanks 1989; Norris 1996). A characteristic carbon isotopic signature has been used as an indicator; the δ13C value of symbiont-bearing species is more 13C-enriched than the non-symbiotic species, reflecting a selective incorporation of 12C during symbiont photosynthesis (“photosymbiotic effect”); the greater the symbiont photosynthesis, the larger the effect. Therefore, the effect is enhanced as the host grows its body size and progressively increases the number of the symbionts. This results in a positive relationship between test size and δ13C. Based on this concept, many authors have studied the size-related δ13C profiles of fossil foraminiferal tests of extinct species to identify their photosymbiotic ecology (e.g., Norris 1996; Bornemann and Norris 2007; Birch et al. 2012). Moreover, the δ13C/size positive gradient has been used as an indicator of the intensity of the photosynthetic activity of symbionts (Kelly et al. 1996; Wade et al. 2008; Edgar et al. 2013). The δ13C/size positive gradient of some photosymbiotic species deteriorated during the peak MECO conditions, as compared with pre-event and post-event levels (Edgar et al. 2013). This deterioration could be attributed to symbiont “bleaching” during the higher SSTs in the peak MECO period. Despite these possible crises of photosymbiosis, many Eocene planktic foraminifera are thought to have been photosymbiotic (Pearson et al. 2006). 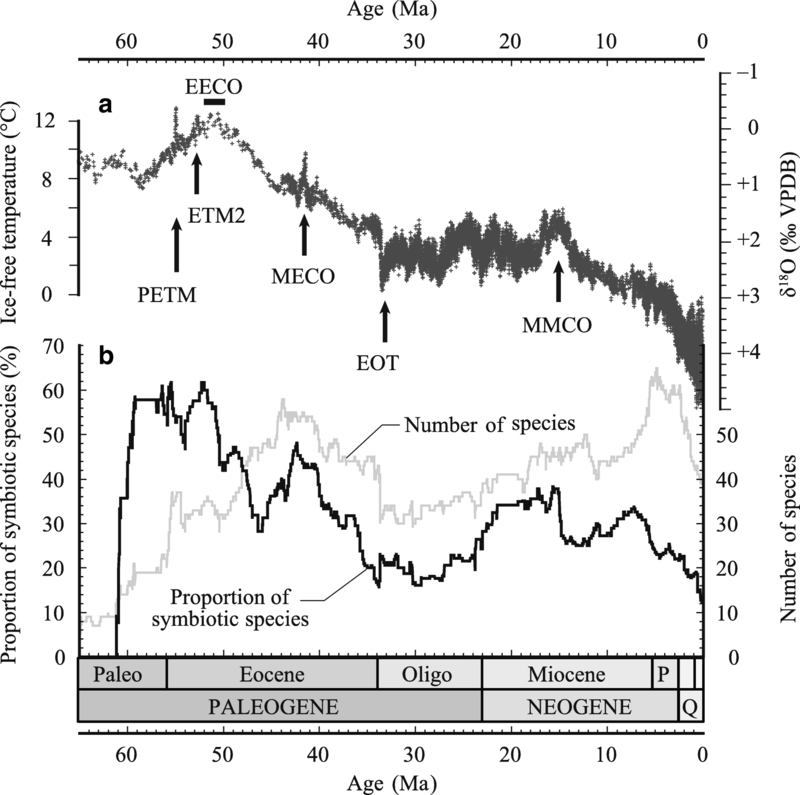 The chamber-by-chamber isotopic profiles of three representative Eocene genera, Morozovella, Acarinina (both known as symbiotic), and Subbotina (known as non-symbiotic), recovered from IODP Site U1407 exemplify these ecologies. As expected, the results revealed a clear contrast in δ13C profile between the symbiotic and non-symbiotic species (Fig. 16a, b). A notable finding here is that the last chamber of the two symbiotic species showed remarkably low δ13C values, comparable with that of the non-symbiotic Subbotina. This may indicate that at the time of calcification of the last chamber, these two symbiotic species became virtually “non-symbiotic” with the loss of their symbionts. This may have been caused by the digestion or dissolution of the symbionts, as seen in cultured modern photosymbiotic species (Bé et al. 1983; Takagi et al. 2016a). The modern and fossil examples of symbiont loss mentioned above should be part of the natural life processes of foraminifera. Such lack of a “photosymbiotic effect” in only the last chamber cannot be identified using conventional δ13C/size methods. However, it can be distinguished in chamber-by-chamber δ13C profiles (Fig. 16a). Therefore, a change in photosymbiotic activity, or even a “bleaching” phenomenon, can theoretically be identified by precise δ13C analyses of individual chambers. Although the possibility of “bleaching” in the Eocene warm period cannot be denied, caution should be used when interpreting the δ13C profiles. Following the rule of metabolic rates, an elevation of SST enhances both photosynthetic rates and respiration rates with different temperature sensitivities. Temperature sensitivity is higher for respiration than for photosynthesis (e.g., Lombard et al. 2009). This means that deterioration of the δ13C gradient can also be caused by elevation of the respiration rate under high SST conditions because the effect of respiration on test δ13C shows the opposite trend. When comparing the δ13C/size gradient at different time slices with different climates, attention must be paid to the balance of photosynthesis and respiration under each SST. In any case, to our best knowledge, no “bleaching” phenomenon due to high temperature has been reported for modern planktic foraminifera under laboratory culture. Interestingly, through the macroevolutionary history of Cenozoic planktic foraminifera, the proportion of photosymbiotic species to the total number of species corresponds well to the pattern of Earth’s climate change (Fig. 17). This proportion became larger during hyperthermal events like the Paleocene/Eocene thermal maximum, Early Eocene climatic optimum, and MECO. This suggests that the photosymbiotic association with algae would make foraminifera more adaptive to such hot climates and accelerated their speciation. In addition to such adaptivity in the evolutionary scale, it is important to understand the individual-scale mechanism of photosymbiosis. Since an individual holobiont is involved with photosynthesis, respiration, and calcification, the net fitness of the photosymbiotic system is difficult to evaluate. The P/E transition event at 55.5 Ma is often referred to as the Paleocene/Eocene thermal maximum, characterized by a huge concomitant perturbation in the global carbon cycle (Zachos et al. 2001). Large δ13C anomalies observed in deep-sea sediments, terrestrial soil carbonates, and mammal teeth (associated with a major turnover in land mammal assemblages), was − 3‰ (up to − 6‰) over an interval of ~ 100–200 kyr near the end of the Paleocene (Kennett and Stott 1991; Norris and Röhl 1999; Pagani et al. 2006). The duration of these events was estimated to be no more than 10 kyr, with P/E transition conditions with a total duration of about 215 ± 5 kyr for δ13C excursion (Röhl et al. 2000) (Fig. 18). Benthic foraminiferal δ18O values indicate that oceanic deep waters warmed substantially worldwide, from ~ 10 to ~ 18 °C in high latitudes (Kennett and Stott 1991) and from ~ 10 to ~ 16 °C in the tropics (Bralower et al. 1997). SSTs, as recorded by planktic foraminiferal δ18O and/or Mg/Ca values, showed little change (from ~ 26 to ~ 28 °C) at low latitudes but larger increases at high latitudes, leading to diminished vertical and latitudinal thermal gradients (e.g., Kennett and Stott 1991; Kelly et al. 1996). Actually, the declines in coral reefs could be attributed to an SST in the tropics that was beyond the maximum temperature range of corals (Scheibner and Speijer 2008). In terrestrial environments, a widespread increase in kaolinite was interpreted to herald a warm and wet climate. In association with these environmental changes, ocean circulation, primary productivity, carbonate dissolution, and the hydrologic cycle showed severely disturbed wide-ranging environments (Ernst et al. 2006; Stassen et al. 2012). In order to explain the large negative shift in δ13C value, the dissociation of a large amount of methane hydrate (with a δ13C of − 60‰) is considered to be the most plausible mechanism (e.g., Dickens et al. 1997). The amount of carbon required to explain the negative δ 13C shift is estimated to be as large as 2000 PgC (1 PgC = 1015 g of carbon) (Dickens et al. 1997; Zachos et al. 2005). In oxygenated condition, the injected methane is easily converted to CO2 within a few years. Carbon dioxide is weakly acidic; therefore, it would lead to a reduction in deep-sea pH, possibly triggering a rapid (< 10 kyr) shoaling of the global CCD by > 2 km, followed by gradual recovery (> 100 kyr) (Zachos et al. 2005). The δ 13C anomaly also coincides with the most dramatic extinction of 35–50% of cosmopolitan benthic foraminifera in the past 100 million years and an apparent change in the dominance of calcareous to agglutinated benthic fauna at some deep seafloor sites (Kawahata et al. 2015). Carbonate saturation level was more reduced by the higher pressure in the deep-sea. Such characteristics make the P/E transition event a possible analog of the modern human perturbation to the ocean–atmosphere carbon system. At the P/E transition, methane was rapidly released to the ocean and atmosphere at an average rate of ~ 0.2 PgC year−1 of CO2 over 10 kyr (Dickens et al. 1997; Zachos et al. 2005). This rate is approximately 1/30 of the current global emission rate (~ 7.8 PgC year−1) of anthropogenic carbon input. Terrestrial waters stimulate physical and chemical weathering of both silicate and carbonate rocks and transport HCO3− as well as other forms of dissolved and particulate carbon from land to the ocean (Eqs. 2 and 3) (e.g., Hecht and Oguchi 2017). In particular, silicate chemical weathering is one of the most important processes working as a net sink of CO2. Therefore, it also functions as neutralizing process against OA. It is generally assumed that one of the most active chemical weathering scenarios globally occurs in the high Himalaya, as a result of the ongoing uplift of the Himalayan–Tibetan Plateau and the heavy rains associated with the Indian–Asian monsoon, which is also linked with the North Pacific monsoon (e.g., Tada and Murray 2016; Tada et al. 2016; Clift 2017; Dado and Takahashi 2017). Gaillardet et al. (1999) compiled dissolved major ion data in Himalayan Rivers and reported high chemical weathering rates for silicate in the Ganges–Brahmaputra and Ayeyarwady Rivers, and for carbonate in the Yangtze River. Raymo et al. (1988) and Raymo (1991) focused on the Sr isotope record in marine sedimentary cores and found that active silicate weathering in this area may have triggered global cooling during the Eocene. However, the importance of a long-term CO2 sink by silicate weathering in this area has been questioned in recent studies. Bickle et al. (2001, 2003) reported that Sr isotopes cannot be used as a proxy for silicate weathering owing to regional metamorphism in this area. Manaka et al. (2015a) noted that the silicate weathering rate reported in previous studies for the Ayeyarwady River were largely overestimated, and they recalculated the CO2 consumption rates by silicate and carbonate weathering in the entire Himalayan river basin, reporting values of 0.012 PgC year− 1 and 0.024 PgC year−1, respectively. In contrast, France–Lanord and Derry (1997) proposed that erosion of organic carbon and its burial in the Bengal Fan may have controlled the global carbon cycle and climate change in this era. The estimated global CO2 consumption rates by silicate and carbonate weathering are 0.13 PgC year−1 and 0.15 PgC year−1, respectively, based on the chemical compositions of major world rivers given by Gaillardet et al. (1999) and modified data for the Ayeyarwady Rivers by Manaka et al. (2015a, b). Hartmann et al. (2009) highlighted extremely high silicate weathering rates in small areas such as the Pacific islands (so-called hyperactive areas and hot spots), based on a high-resolution global lithological map and the calculated weathering rate of each rock types. Current global warming will continue to be a pressing problem over timescales of decades to centuries because the anthropogenic CO2 release rate from fossil fuel use and cement production is 7.8 PgC year−1 (IPCC 2013a), much larger than the CO2 consumption rate of chemical weathering (Table 2). Anthropogenic land use changes such as deforestation also lead to a carbon release of 1.1 PgC year−1 to the atmosphere. Currently, a half of anthropogenic CO2 release remains in the atmosphere (average atmospheric increase: 4 PgC year−1), while approximately a quarter is absorbed into the terrestrial biosphere and the ocean. Terrestrial photosynthesis absorbs 123.0 PgC year−1 CO2, most of which (118.7 PgC year−1) is returned to the atmosphere via the respiration process. Net CO2 uptake by the terrestrial biosphere is only 4.3 PgC year−1. The pCO2 in the global terrestrial waters of lower alluvial basins with well-developed soils and active agriculture is often over several thousand μatm, much higher than the atmospheric level (400 μatm) (Cole et al. 2007; Raymond et al. 2013; Manaka et al. 2015b). 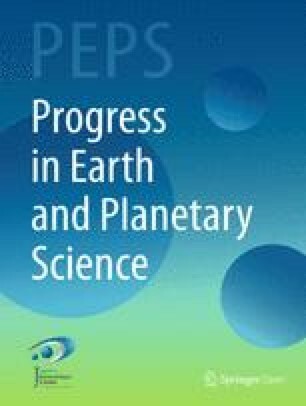 Terrestrial waters can receive 1.9 PgC year−1 of soil carbon, which was originally fixed by the photosynthesis process (Regnier et al. 2013). The global riverine flux of carbon to the ocean is 1.06 PgC year−1 (Li et al. 2017), which could enhance pCO2 in coastal regions. Soil-derived carbon, mainly dissolved organic carbon, is decomposed in the water and released directly to the atmosphere in the form of CO2 (Rasilo et al. 2017). The global CO2 degassing rate from water is 1.1 PgC year−1, which is comparable in magnitude to that from fossil fuel and cement. One of the largest CO2 evasions is reported for the Amazon River; the estimated flux is as high as 0.47 PgC year−1 from the entire basin (Richey et al. 2002). For future environments, global warming is expected to enhance both chemical weathering (IPCC 2013a) and soil respiration (Hashimoto et al. 2015). This warming is predicted to cause extreme rainfall events, particularly in the Himalayan lowland alluvium, which may further increase pCO2 of river water (Goswami et al. 2006). Anthropogenic eutrophication in aquatic ecosystems is another widespread problem globally (Mackenzie et al. 2002). Cai et al. (2011) reported that large riverine inputs of nutrients, as well as OM and dissolved CO2, can enhance the acidification of subsurface coastal waters. In contrast, this eutrophication can enhance photosynthesis, and thus CO2 uptake, in enclosed conditions such as lakes, which may be important to the carbon cycle, particularly in developing countries (Manaka et al. 2013). Therefore, changes in water composition in response to environmental change should be borne in mind in the future. In order to understand the relationship between carbonate dissolution and pCO2 in deep sea, a simple ocean carbon cycle model was used based on the three-box model of Toggweiler and Sarmiento (1985). The details are described in Yamamura et al. (2007) (Fig. 19). The model has five state variables: phosphate, oxygen, potential temperature, alkalinity, and DIC. Salinity is fixed to 35 practical salinity units (psu), to which phosphate, alkalinity, and DIC are normalized. Gas exchanges of CO2 and oxygen with the atmosphere are driven by the respective partial pressure gradients across the air–sea interface and a “piston velocity” of 3 m day−1 (Broecker and Peng 1982). The carbonate saturation depth at the intersection of [CO32−] in the deep box and [CO32−]sat (the carbonate ion concentration that is at saturation with respect to mineral calcite) is calculated from the apparent solubility product Ksp for calcite. The production rate of organic carbon from the surface ocean is expressed as the flux of phosphate, which is assumed to occur with a stoichiometry of P:Corg:-O2 = 1:117:170 (Anderson and Sarmiento 1994). With the production rate, the global average export ratio is adjusted to CaCO3:Corg = 0.1 based on Sarmiento et al. (2002). For initial values, which represent modern conditions, the model predicts [CO32−] of about 94 mol kg−1 and 2 °C in the deep box (Figs. 19 and 3). 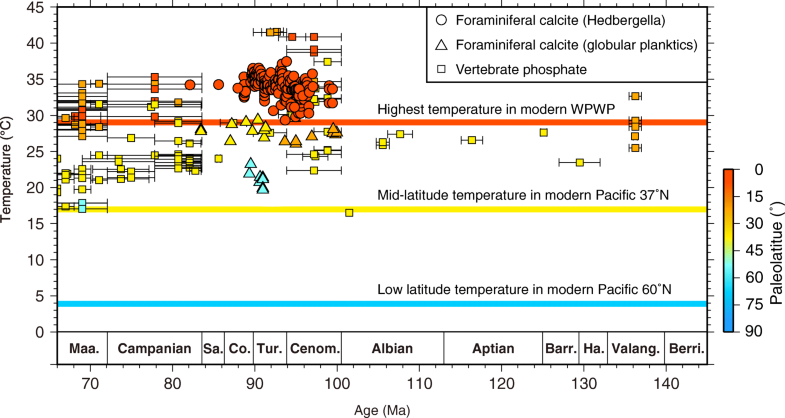 The calcium carbonate saturation horizon under these model conditions is located at a depth of about 3700 m. The mid-Cretaceous is believed to be 6–12 °C warmer than today and had 2–10 times more atmospheric pCO2 (e.g., Berner and Kothavala 2001). The model results also indicate that carbonate dissolution in the northwestern Pacific during the Albian was severe (Fig. 3). However, this is contrary to the geological observation that carbonate was apparently present at paleodepths of ~ 1000–2000 m in DSDP/ODP cores (e.g. Dean 1981). This apparent contradiction may be resolved if there were more alkalinity in the oceans during the Albian, mid-Cretaceous, than today. Global warming with high pCO2, like during the Albian, would have induced intensified hydrological cycles on the Earth’s surface (e.g., Jenkyns 2010). Subsequently, this would have resulted in intensified weathering and increased the supply of nutrients and alkalinity (Eqs. 2 and 3) (Fig. 2). 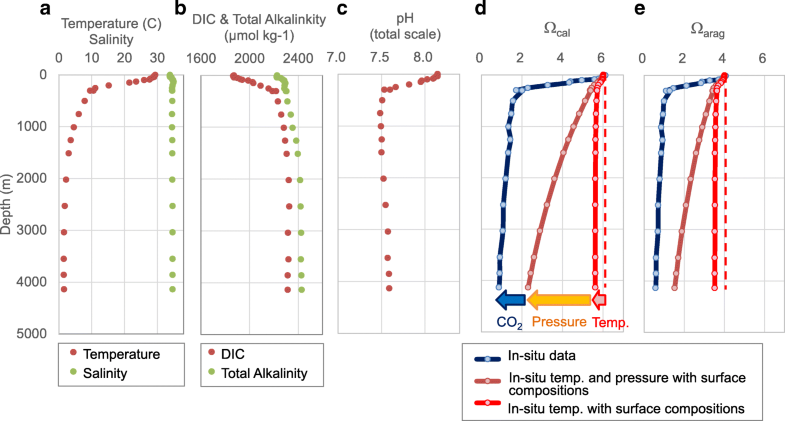 To investigate the effect of a higher alkalinity content in the ocean, a set of model experiments was conducted with the same range of high latitude surface box temperatures and four-times the present atmospheric pCO2 (Fig. 19). In the late Albian, the deep-sea temperature was estimated to have been ~ 17 °C in the equatorial Pacific (Huber et al. 2002) and pCO2 was suggested to vary between approximately two and five times more than present-day atmospheric pCO2 (Bice et al. 2006). 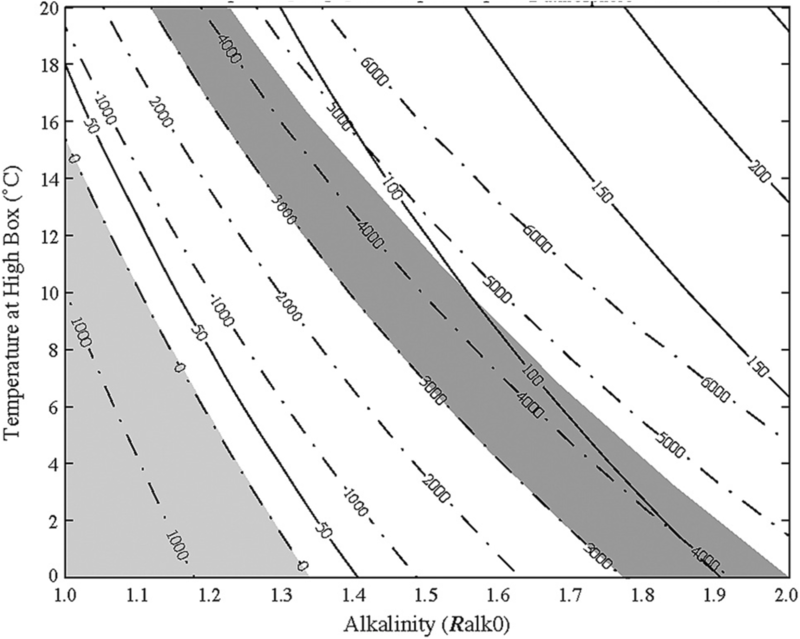 In such a case, the required alkalinity inventory to maintain the level of saturation depth (deep than 2000 m) at the interglacial condition is greater than 1.2 times (Fig. 19). In any case, the model results indicate that under high pCO2 during the mid-Cretaceous, an increase in the oceanic inventory of alkalinity is likely necessary to preserve any carbonate on the seafloor (Fig. 2; Table 1). Otherwise, the entire ocean may be undersaturated with respect to CaCO3. It is commonly believed that increasing pCO2 will induce an enhanced greenhouse effect and change seawater chemistry, resulting in future OA (Figs. 2 and 3; Table 1) (IPCC 2017). The mid-Cretaceous represents one of the warmest climate intervals during the entire Phanerozoic (termed the “hot house”) due to enhanced pCO2 (e.g., Takashima et al. 2009). Actually, the mid-Cretaceous is believed to have been a much warmer environment with much higher pCO2 (e.g., Berner and Kothavala 2001). The fact that we see relatively better carbonate preservation in the mid-Cretaceous suggests that the ocean surface was sufficiently basic, despite higher pCO2, to allow the growth of calcifying producers. Alkalinity should have been supplied by chemical weathering on the land. A higher alkalinity inventory in the ocean is in fact expected according to an enhancement of the chemical weathering of silicate rocks, driven by pCO2 and intensified hydrological cycles on the Earth’s surface (Fig. 2) (e.g., Broecker and Sanyal 1998; Cohen et al. 2004). The biogeochemical cycle on the Earth’s surface yields a buffering system for pH and carbonate ion change (Fig. 20). Therefore “high speed” and “high level” pCO2 are the primary and secondary factors, respectively, leading to acidification in the Earth surface’s system. Too rapid a release of anthropogenic CO2 (today and at P/E boundary) will yield severe OA in deep ocean. In combination with the high solubility of carbonate minerals (Fig. 1), benthic fauna will thus be threatened. In the global carbonate budget, foraminifera and corals are two major calcifiers contributing to the burial of carbonate in sediments/reefs. Our extensive review of these calcifiers suggests similar, but slightly different, responses of two representative species to ocean warming and acidification. Both calcifiers generally show negative responses to OA (increasing pCO2 and decreasing saturation state), although their responses are dependent upon life stage and taxa. The response of corals to heat stress is variable among species. The response of corals to acidified seawater may depend on the degree of seawater transport into the site of calcification (calcifying fluid), but this interpretation remains controversial. Foraminifera, which actively pump protons out from the site of calcification and are surrounded by a low external pH, may deal with calcification under elevated pCO2 using an energy cost approach. 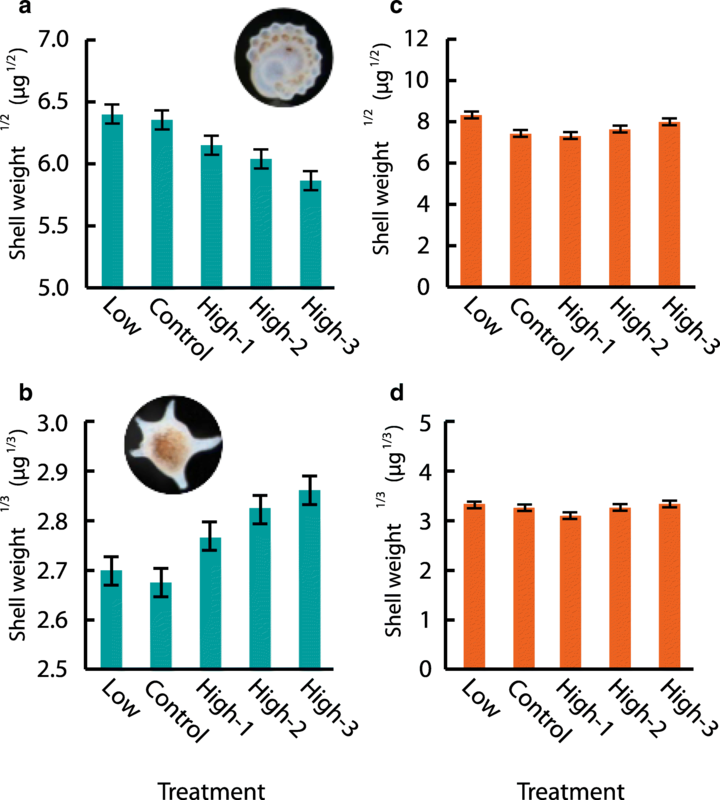 Ocean warming (i.e., higher temperature) likely induces the bleaching of symbiont-bearing marine calcifiers, including corals and foraminifera, and results in the suppression of calcification of both groups; death of the host organisms may result. However, symbiotic foraminifera appear more robust and resilient than symbiotic corals at higher temperatures. During warm periods of the Earth’s history, when SSTs and deep-water temperatures exceeded those of modern oceans, foraminifera survived under extremely warm, high pCO2, and dysoxic conditions. However, corals and living reefs never existed during these warm periods, known as the reef gaps (Veron 2008). Therefore, benthic foraminifera seemed more adaptive and robust than corals to ocean warming and acidification over the Earth’s history; they will likely remain so in the future. On the other hand, during a possible OA event at 65 Ma at the end Cretaceous mass extinction, all remaining ammonites and belemnites became extinct, as did a high percentage of bivalves, gastropods, and echinoids, and almost all planktic foraminifera. Scleractinian corals appear to have just barely survived and 1 (the Faviidae) retained 6 of its original 16 genera; the others survived with only 1 or 2. Therefore, in order to pursue the issue of adaption and robustness, it is required to further understand the mechanisms underlying variations in sensitivity to heat stress and acidified seawater for both corals and foraminifera. Since the pCO2 in the atmosphere is currently increasing, pCO2 and DIC in seawater are increasing, while pH and the saturation state of carbonate minerals are decreasing without any change in total alkalinity. However, over the long-term, it is well known that alkalinity has fluctuated largely in the Earth’s surface environment. Therefore, it is important to quantitatively reconstruct alkalinity, which is another key factor determining the saturation state of carbonate minerals. CO2 dissolution into seawater increases DIC and pCO2 and decreases pH, with no change to total alkalinity. While OA may progress ubiquitously, the corresponding changes in pH and pCO2 vary locally. Since pCO2 is sensitive to temperature (~ 4% increase per 1 °C), OA is more critical in the polar and high-latitude regions, as compared with temperate and tropical regions. In addition, older deep-water has enhanced acidity owing to the addition of CO2 via the degradation of OM, which promotes carbonate dissolution via a synergistic effect with high pressure. Anthropogenic CO2-driven OA will pose a severe threat to marine calcifying organisms because the calcification rates of organisms generally decrease in acidified seawater. However, some opposite responses of reef-dwelling larger benthic foraminifera are reported. In the case of the coral calcification response of Aropora digitifera to acidified seawater, calcification tended to decrease according to the increase of pCO2 in both aposymbiotic and symbiotic polyps, although the calcification of adult branches was not reduced markedly in higher pCO2 conditions. This suggests that OA response may depend upon life cycle stage. As exemplified by reef-building corals and reef-dwelling larger benthic foraminifera, photosymbiosis is regarded as an adaptive ecology for living in warm, oligotrophic, and well-lit oceans. Bleaching is likely a global threat to marine symbiont calcifying organisms, especially at high temperature and enhanced light intensity. Based upon Ca isotope measurements of coral skeletons, the transport path of Ca2+ and the extent of its activity would predominantly control the carbonate precipitation rate. Visualization of the extracellular pH distribution shows that proton pumping produces a high internal pH and large internal–external pH gap associated with foraminiferal calcification. X-ray micro-computed tomography, which can estimate shell density, indicates that the dissolution of Globigerina bulloides shells begins at the central area of the shell, whereas the outer calcite layer, with a euhedral crystalline structure, is resistant to dissolution. Alkalinity, another key factor controlling OA, has a much longer residence time. The “high speed” and “high level” of pCO2 are the primary and secondary factors, respectively, leading to severe OA in the Earth surface’s system. Too rapid a release of anthropogenic CO2 (today and at P/E boundary) would bring severe OA, even in the deep ocean. This research was partly supported by the Japan Society for the Promotion of Science Grants-in-Aid for Scientific Research (A) to H. Kawahata (15H02139). This work was supported by JSPS KAKENHI Grant Numbers 22224009, 15H02139, 15H02813, 18H03366, and 18 K18793. Please contact author for data requests. All authors will share data and materials. HK proposed and designed the study. KF described the part of the manuscript, including the topic on the bleaching in algal symbiont-bearing large benthic foraminifera. AI described the part of the manuscript, including the topic on the bleaching in corals. MI described the part of the manuscript, including the topic on biomineralization of corals based on geochemical analyses. SI described the part of the manuscript, including the topic on deep-sea carbonate dissolution and progressive foraminiferal shell dissolution. AK described the part of the manuscript, including the topic on Response of foraminifera against ocean acidification. AM described the figures. TM described the part of the manuscript, including the topic on long-term neutralizing process against enhanced pCO2. KM described the part of the manuscript, including the topic on the extreme warmth in the Cretaceous greenhouse system. HT described the part of the manuscript, including the topic on warmth in the Middle Eocene Climatic Optimum (MECO) event and foraminiferal photosymbiosis. TT described the part of the manuscript, including the topic on biomineralization of foraminifera. TY described the part of the manuscript, including the topic on characteristics of biotic and abiotic carbonate minerals. AS described the part of the manuscript, including the topic on general feature of marine carbonate system. All authors interpreted the data, read, and approved the final manuscript. No special information for each author. Bijma J, Hönisch B, Zeebe RE (2002) Impact of the ocean carbonatechemistry on living foraminiferal shell weight: Comment on "Carbonateion concentration in glacial-age deep waters of the Caribbean Sea" by Broecker WS, Clark E, Geochem Geophys Geosyst 3:1064. https://doi.org/10.1029/2002GC000388.